The most successful ice cream trucks are not the ones that just sell prepackaged novelties, they are the ones that sell “real” ice cream, you know the soft serve or hard ice cream that everyone knows and loves. People want their ice cream with hot fudge and sprinkles and mini M&Ms, and this is exactly the kind of business that ice cream parlors specialize in. Your ice cream parlor has many advantages but think about the drawbacks for a second. You can only sell in one location. Everyone has to come to you. Think about all those people what would buy your ice cream every night if it was just delivered to their doorstep. All the social gatherings that happen away from your shop. This is the power of a mobile ice cream parlor. My business expertise is in running ice cream trucks. Compared to prepackaged ice cream, selling soft serve and hard ice cream is both easier on your wallet and has a much higher profit margin, as well as a higher selling price. 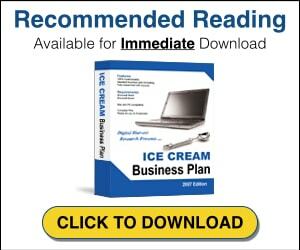 You can expect to make 2 to 4 dollars profit off every single ice cream cone or sundae you sell. A standard ice cream truck selling only prepackaged ice cream can only expect half of that. There are other benefits. You have an advantage over other ice cream trucks because people in your community already know your brand and trust your product. For most people once they find an ice cream shop they like they never switch, so you will be able to gain instant trust from all of your loyal customers. Branding is also very important and you will want to invest in a custom designed vinyl covering for your truck or a professional paint job. It should use the same color scheme as your brick and mortar store and can include pictures of your most popular items or a mascot or a blown up version of your logo. The design can be simple or complex; the only thing you need to make sure of is that your truck is instantly recognizable from a distance. Expect to spend at least $1,000 on your truck design but know that it is well worth the cost in the end to get it done right. With that said, the real money is made when you are serving large amounts of customers at corporate events, festivals, catered parties and concerts. Once you have your truck set up the most important thing you need to focus on is finding customers. If you already have a mailing list or a list of catering customers you should start with them. Send an email or preferably a paper brochure to all your customers with pictures telling them about your truck. Feature your truck on your website if you have one. And if you don’t have one, get one, they are so cheap! You could pay one of your computer savvy employees 100 bucks and they could set up a simple one over the weekend. You should also personally hand out brochures to the businesses in your area. The best places are large office building and office parks. From my experience I got one new customer for every 7 to 10 brochures I gave out. Send one of your employees out and have them spend the whole day driving around to office parks handing out your flier. Make sure you give one to every business in each office building because many have multiple businesses renting space in each one. Last but not least use your ice cream parlor to market your new truck. Put up big posters showing your new truck and if one of your employees is an artist have them make miniature paper models of your truck that you can hang from the ceiling or have on your counter as a tip jar. You can count on your loyal customers to be the first to try out your new truck and spread the word to their friends. You could even think about giving a discount or coupon to the first 10 people that book a birthday party with a free sundae or gallon of ice cream. Once this is all up and running the process is simple. When you have scheduled parties or business events (which are 1-2 times a week, usually same time same day every week) you go to those, and during your off time you go to the local parks or baseball fields and sell there. When you are starting out it will be mostly the latter but this will change as you begin to market more and hand out your fliers. You should use this time to test out which places will get you the most customers and figure out a good rotation for when to move between spots. With that said, it’s important that you get started as soon as possible. Right now is the best time to buy a used ice cream truck and you can get a solid one for $5-10,000. It will take you a few months to get all your paperwork in order and your truck set up so give yourself enough time to get all that handled now. I got started a bit late (March) and I missed a few weeks in early May when I could have made a lot of money and started my marketing sooner with my local businesses. Good luck guys and check out my website for more on the nuts and bolts of how to set up your truck.